Simple, classic and delicious: the roast chicken. You can't go wrong with a staple recipe like this, whether for a special occasion at home or a dinner party. 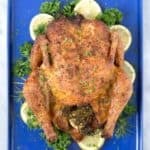 This Roast Chicken recipe with Lemon and Fresh Herbs is packed with flavor and delivers juicy, succulent chicken. 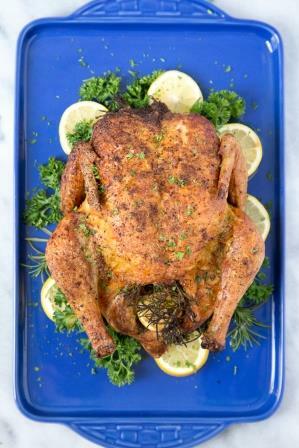 I serve this roast chicken to guests often, the bird looks golden brown and impressive right out of the oven. A chicken dinner with pan gravy might be my favorite meal of all time. I usually roast two chickens at a time so we have lots of leftovers for enchiladas, burrito bowls, chili or chicken salad. This recipe almost ties my favorite Bacon & Sage Roast Chicken – it’s certainly a close second. This lemon & herb roast chicken recipe makes the house smell a-maze-ing. I usually serve it with red rice and a big salad, and everyone is happy. Slice two of the lemons into thick rounds, and cut the other lemon in half. Mix the salt and pepper together in a small bowl and set aside. If the chicken giblets are in the bird, remove them. Remove any excess fat and leftover pinfeathers and pat the outside dry. Liberally coat the inside of the chicken with the salt and pepper blend. Arrange the lemon slices and one of the shallots in the center of a roasting pan to create a bed for the chicken. Lay one of the rosemary sprigs and half of the parsley on top of the lemon slices. Coat the bottom of the chicken with salt and pepper and set it on top. Drizzle the olive oil over the chicken to coat, squeeze the lemon halves over the top of the chicken and stuff the rinds in the cavity, along with the remaining herbs. Cover with the remaining salt and pepper. Roast the chicken for about 1 1/2 hours, or until the juices run clear when you cut between a leg and thigh. Remove the chicken to a platter and cover with aluminum foil while you prepare the pan gravy. Pour the remaining juices from the roasting pan into a saucepan, add the chicken stock to the pan and bring it to a boil. Reduce the heat, and simmer for about 5 minutes, or until reduced by half. Taste the gravy & add salt and pepper as desired. You can present the chicken whole or slice it for serving. Serve immediately with the gravy. This entry was posted in Dairy Free, Main Dishes, Paleo Friendly, Recipes and tagged autism diet, chicken, dairy free, dinner, G-Free Foodie, gfcf, gluten free cooking, gluten free food, kc cornwell, paleo, paleo friendly. Bookmark the permalink.